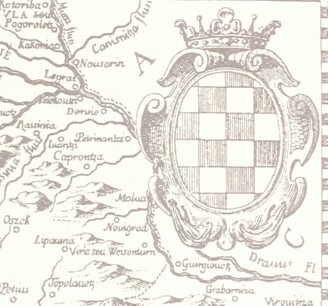 the 1593 battle near Sisak against the Turks. 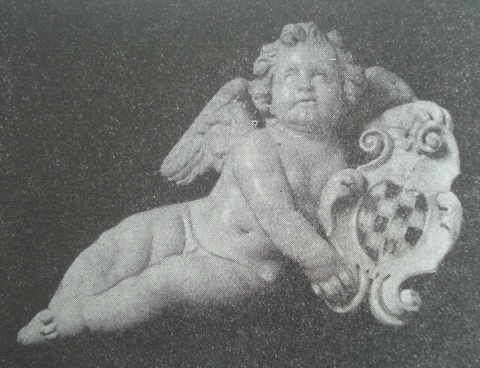 The victory echoed in the whole of Europe. 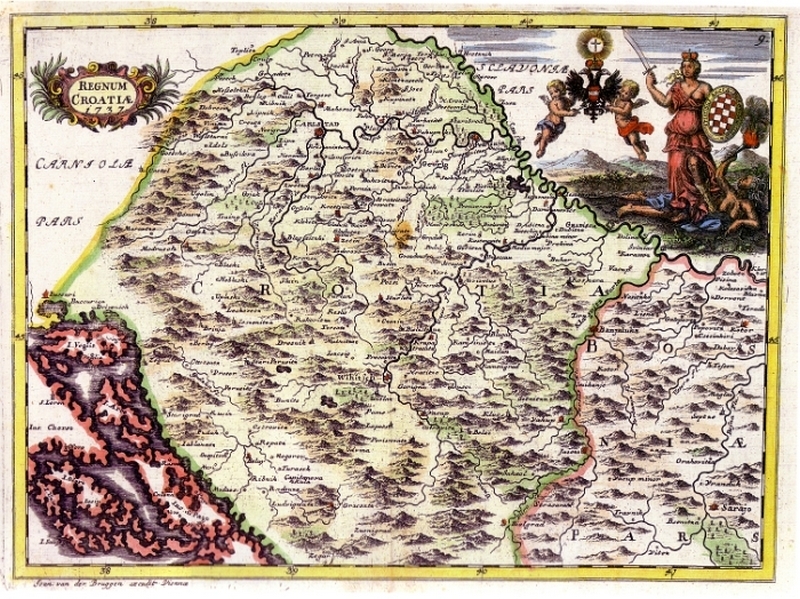 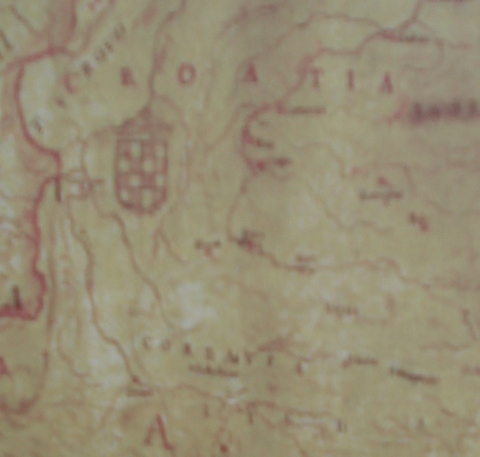 A part of the map of Illyrian provinces (roughly Croatia + Bosnia and Herzegovina) which had the privilege to use St. Jerome institutions in Rome, 1660. 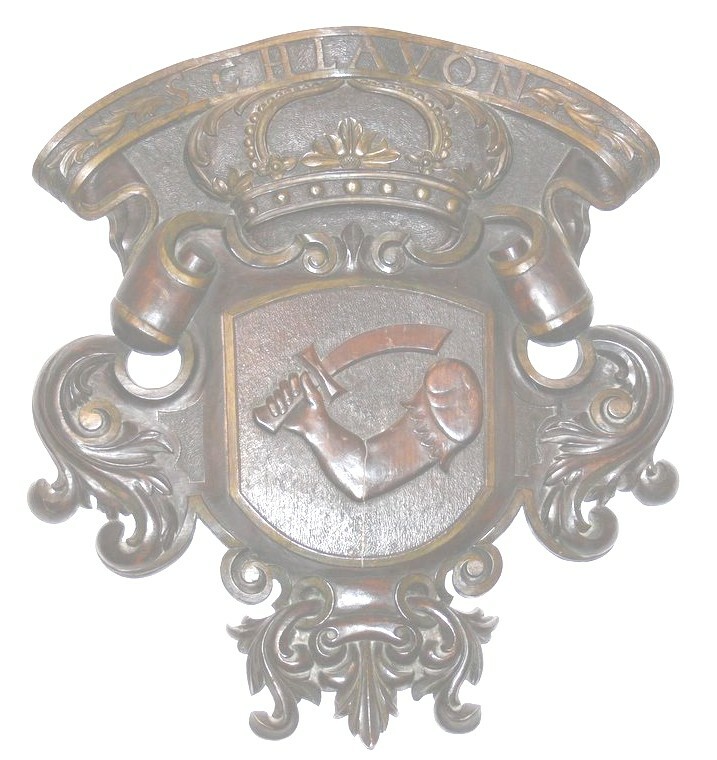 (kept in Rome, in Papinski hrvatski zavod sv. 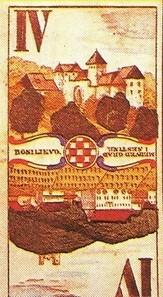 Jeronima - Papal Croatian collegium of St. Jerome). 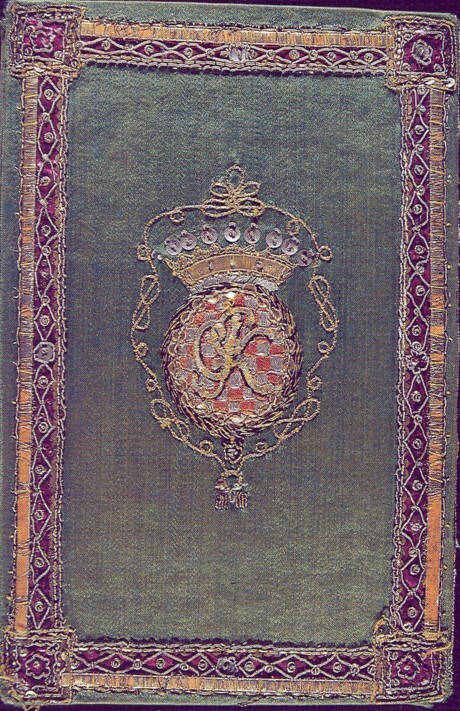 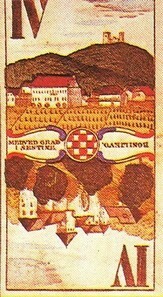 See [Krasic, Počelo je u Rimu, p. 456]. 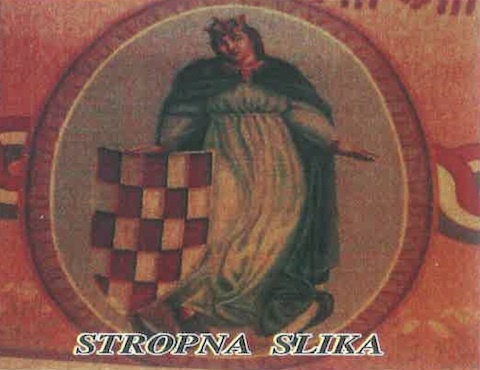 The above text is from Croatian Historical Musem. 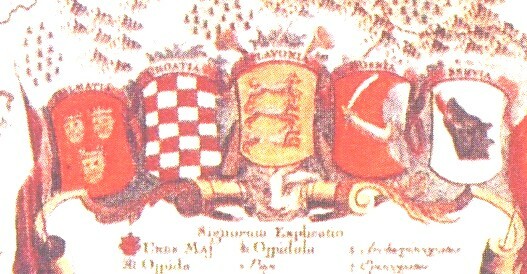 Akademia Dalmatinska, Hervatska, Slavonska in Zagreb, 1669. 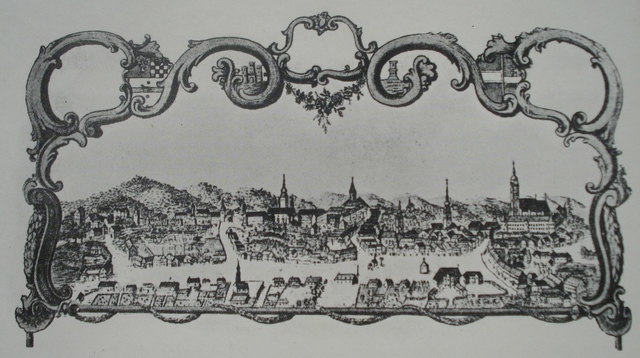 Jesuit gymnasium in Zagreb, founded in 1607 (today Gornjogradska gimnazija in the Upper Town of Zagreb) . 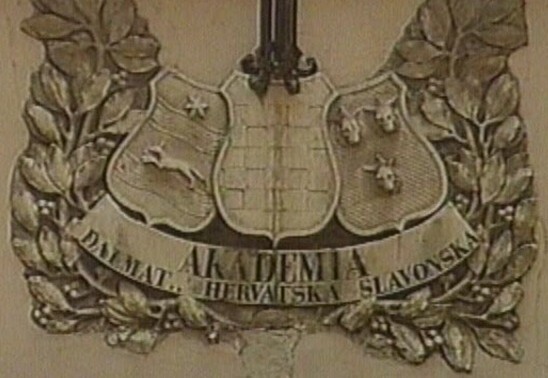 were accorded to the Jesuit Academy in the Royal Free City of Zagreb. 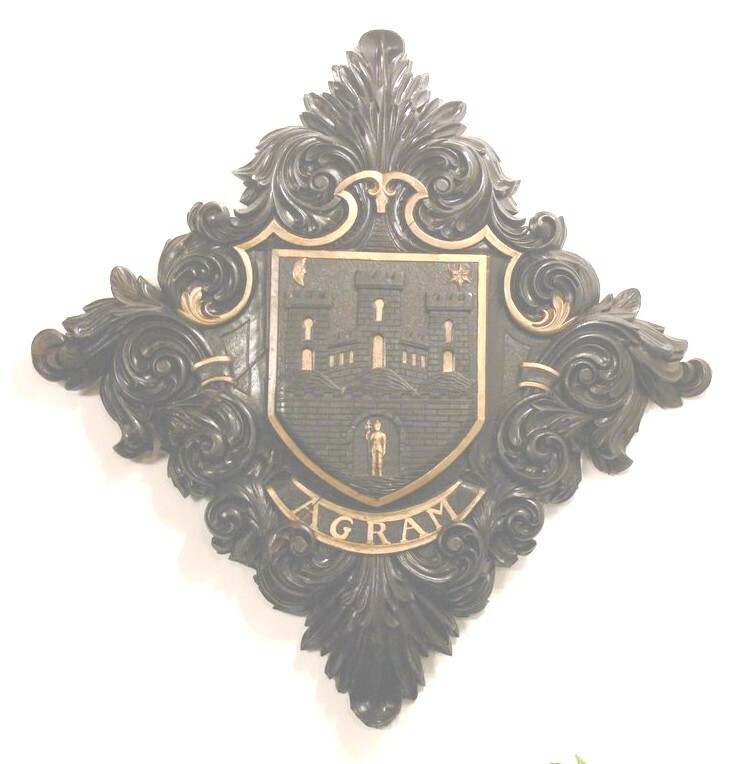 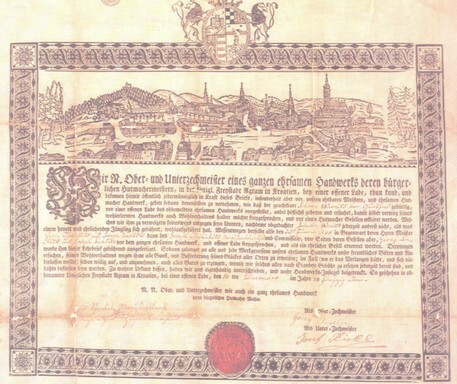 This represents the beginning of the University of Zagreb. 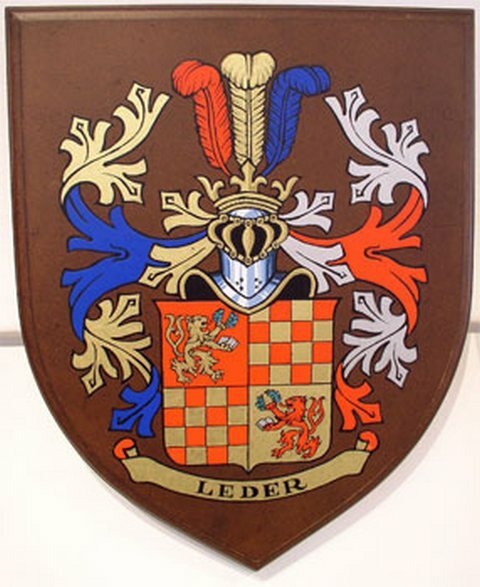 Shiled that Lovro Leder, nobleman from the Turopolje District, obtained in 1672.
of the United Kingdom (Trojedna Kraljevina) of Croatia, Dalmatia and Slavonia 1680-1693. 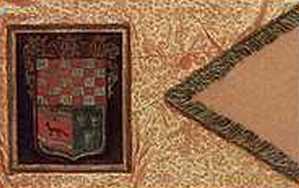 The coats of arms are on his official ban's flag, and this is the oldest known such ban's flag. 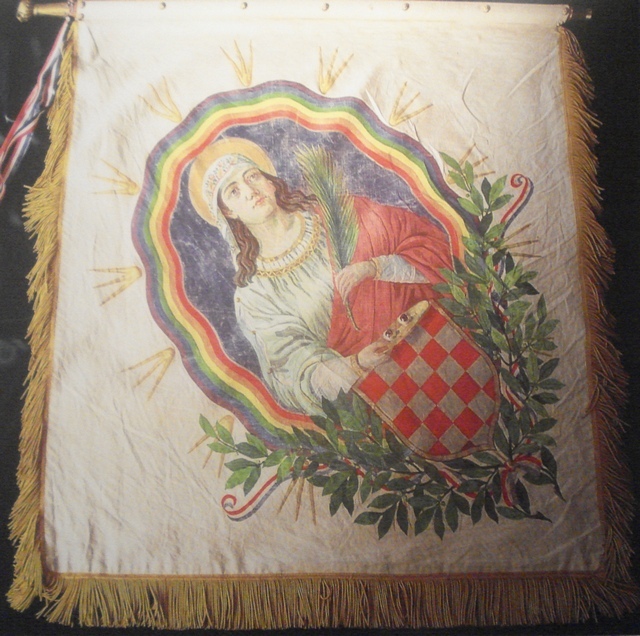 The flag is kept in the Zagreb Cathedral. 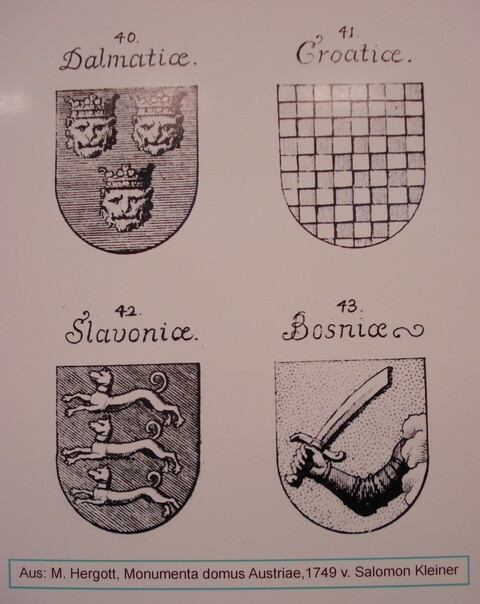 Photos by Sanjin Strukić. 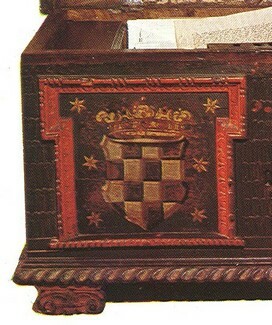 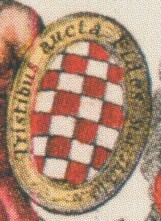 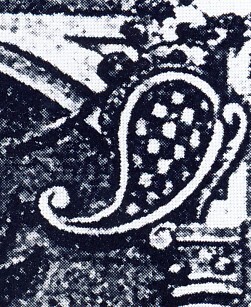 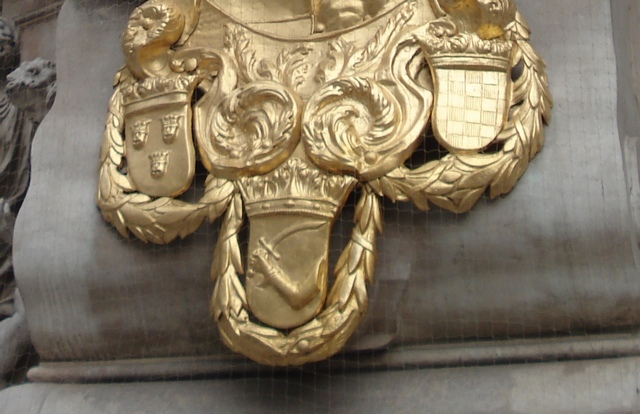 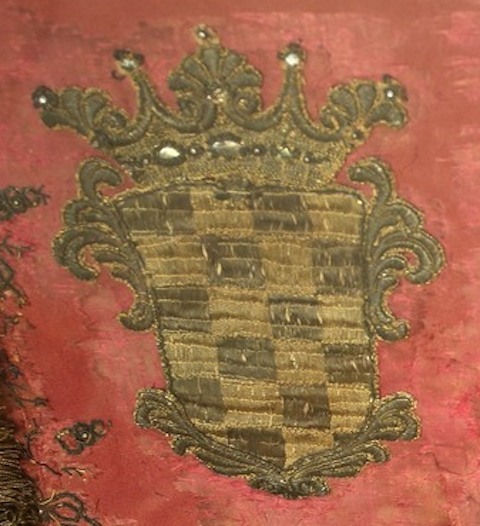 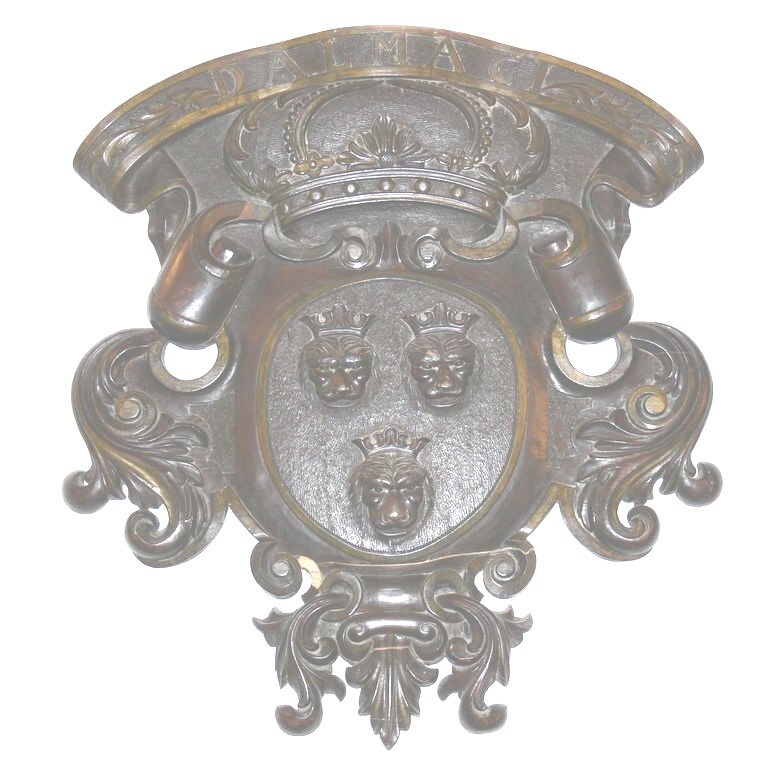 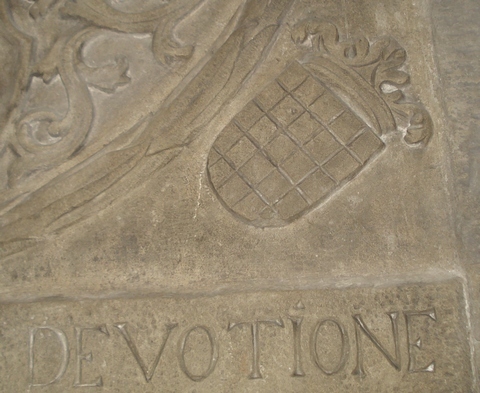 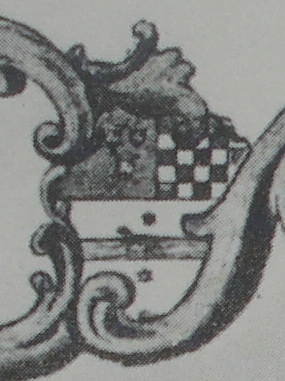 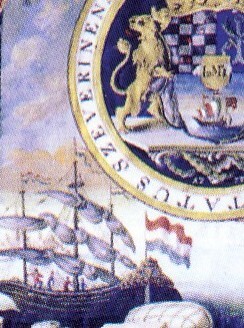 A detail from Coat of Arms of Pavao Ritter Vitezovic (1652- 1713), Croatian historian and writer. 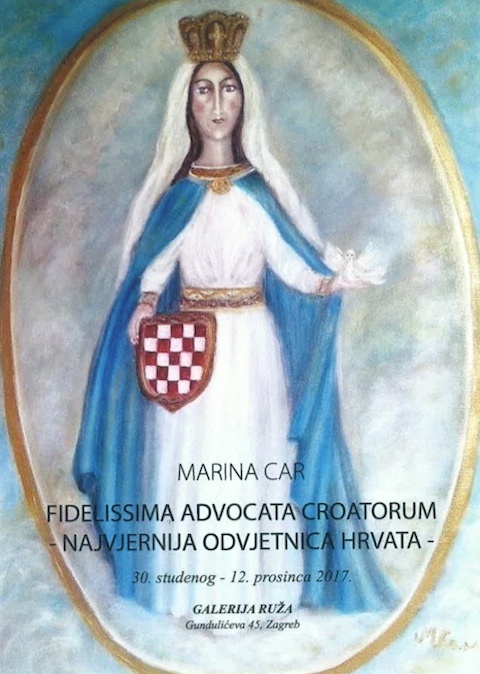 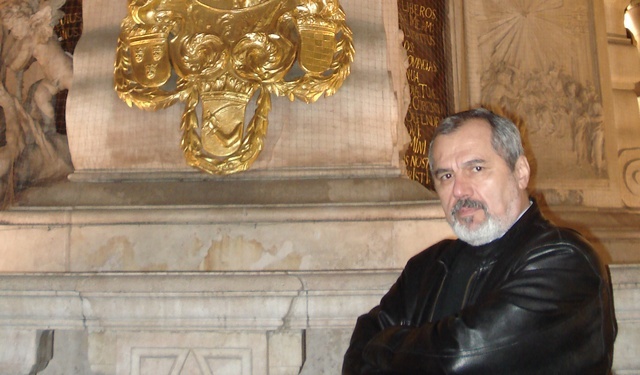 More extensive biography is available in Croatian. 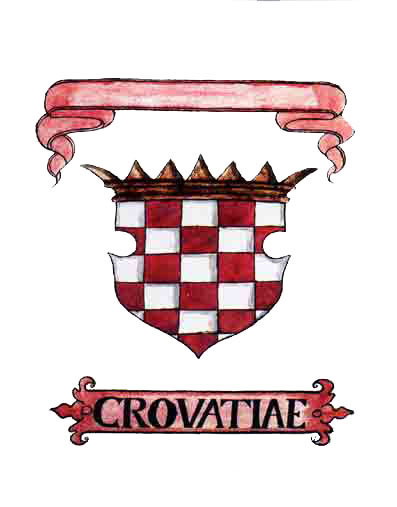 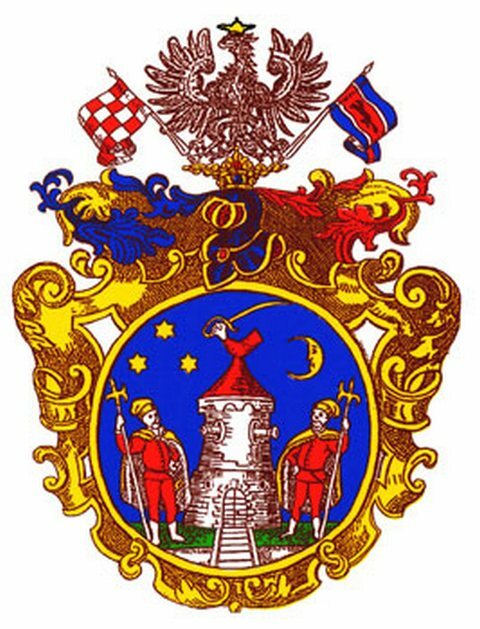 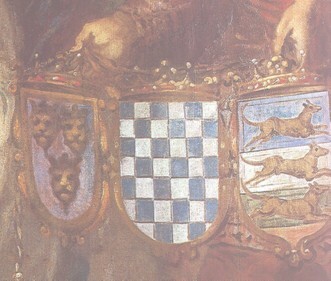 representing coat of arms of the Kingdom of Croatia, Slavonia (on the right) and Dalmatia (on the left). 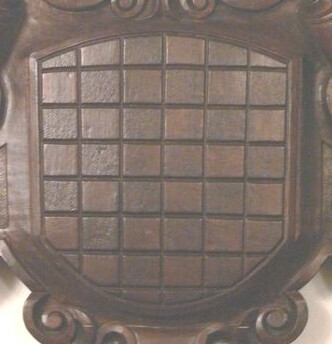 Kept in the Zagreb City Museum. 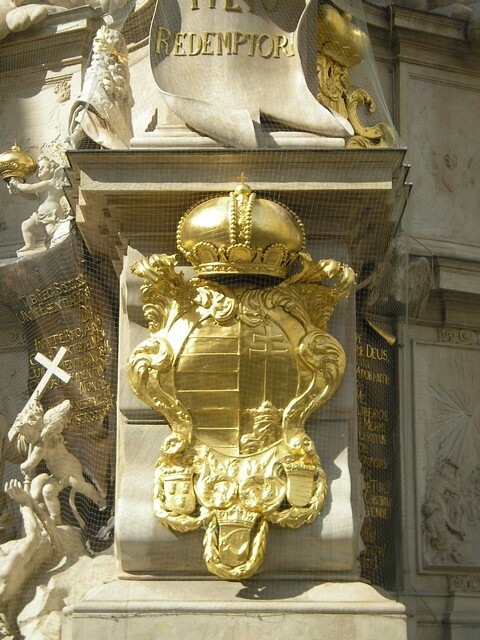 Vienna (in Am Graben, not far from St. Stephen's Cathedral), Austria; Pestsäule (1693): Coat of Arms of Dalmatia, Croatia and Bosnia (Rama). 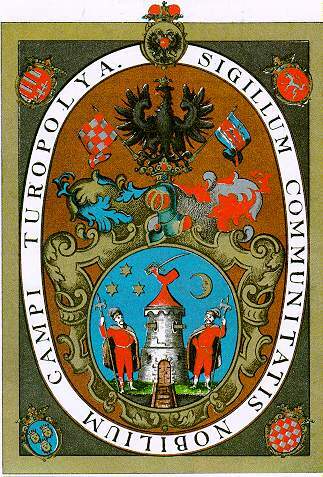 By the courtesy of Mr. Kristian Dumancic, Vienna. 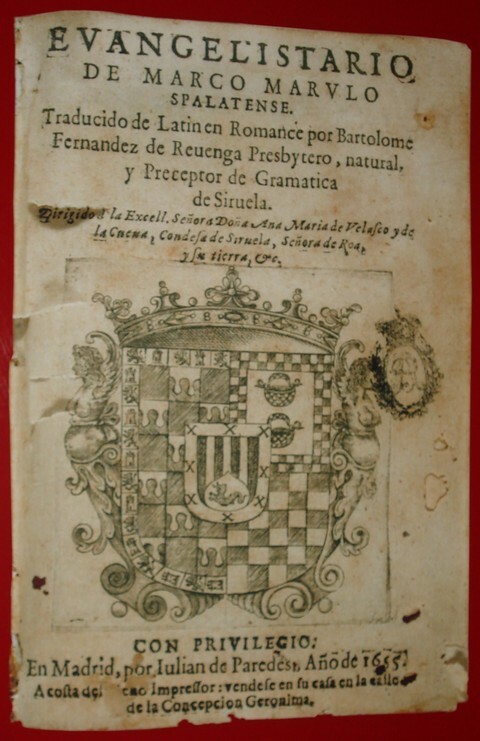 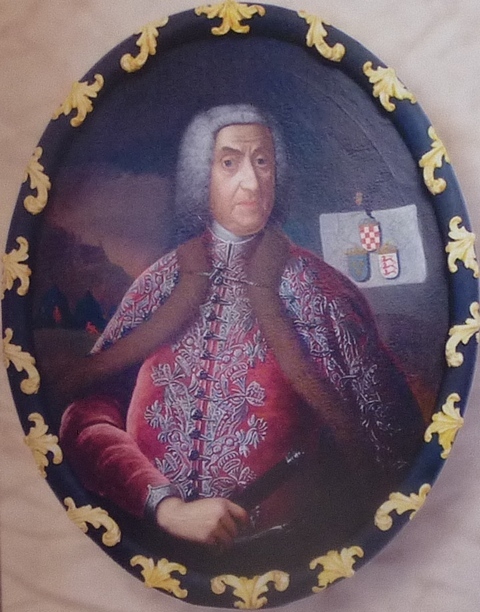 Ivan Pálffy, Croatian ban (Governor) 1704-1732, ban of United Kingdom of Croatia, Slavonia and Dalmatia. 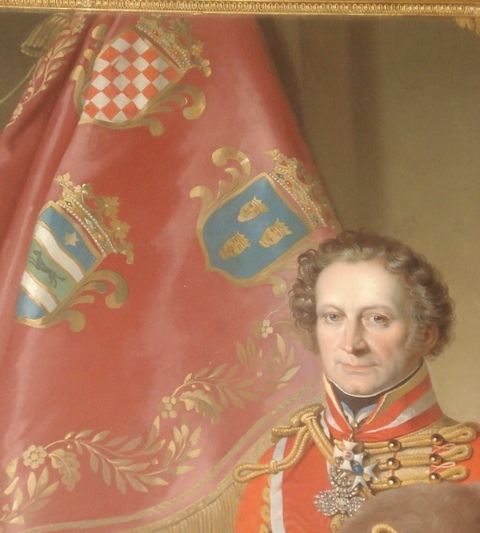 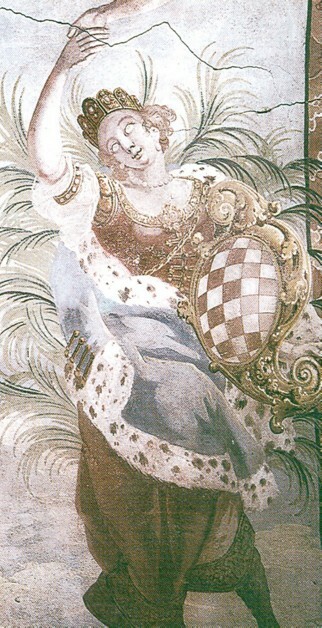 Portrait kept in the Croatian History Museum, Zagreb (detail). 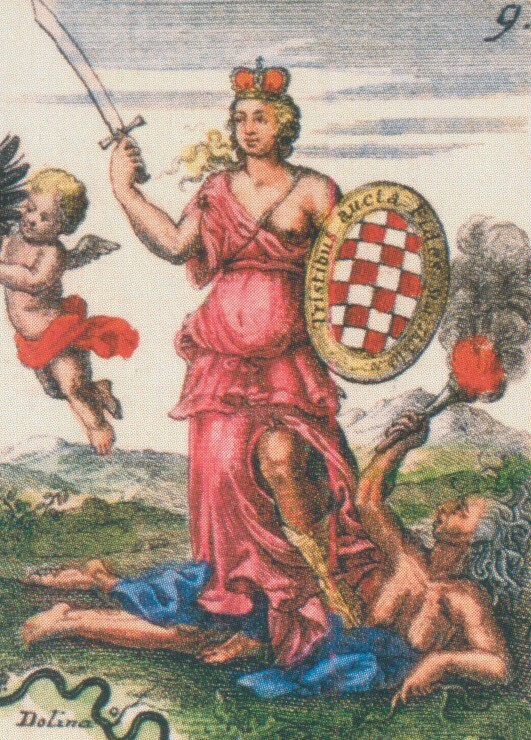 ...BEBGNA KOVICH ALIAS GRUBISSICH ILIRICAE NATIONIS (i.e. 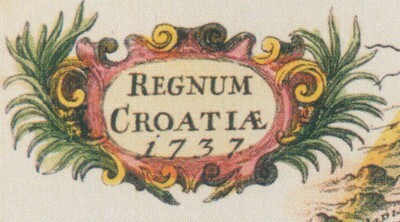 of Croatian Nation), ... 1732.
where Bartol Jurjevic (or Gyurgievits) was born. 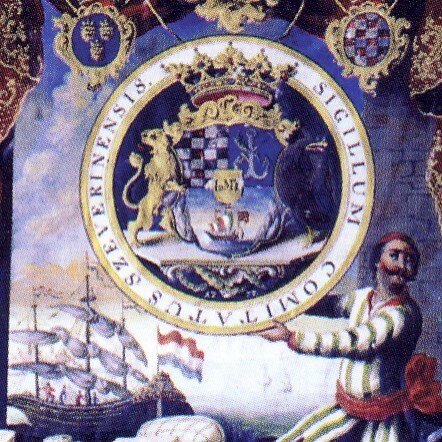 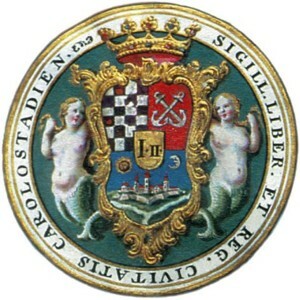 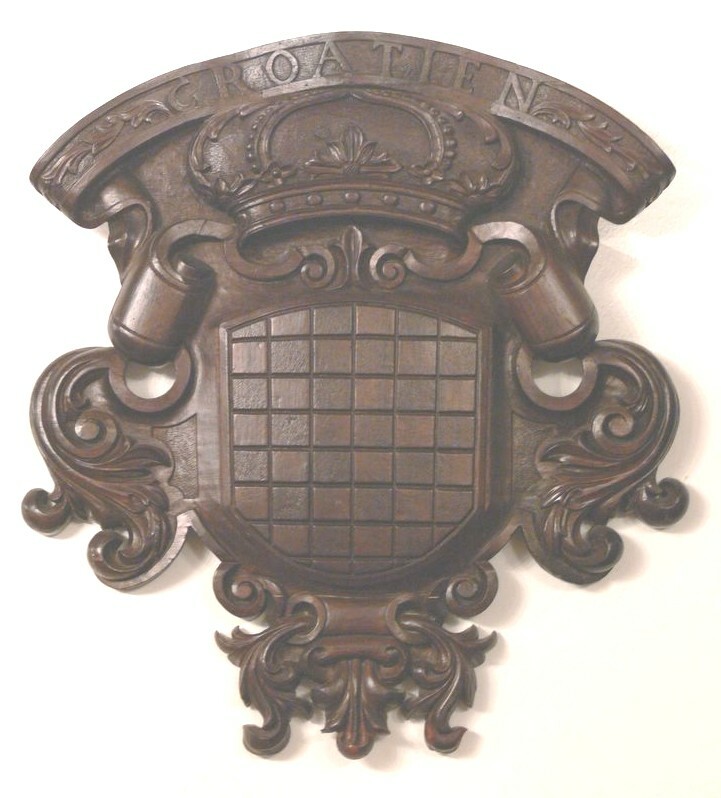 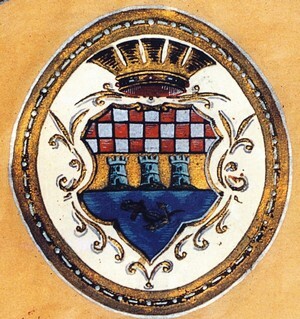 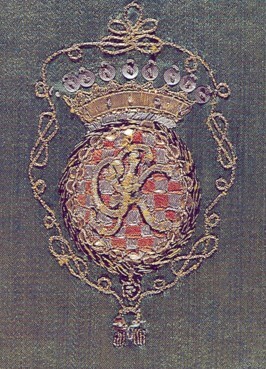 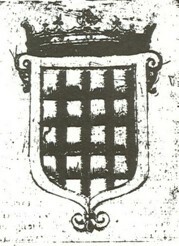 Croatian Coats of Arm from 1749. 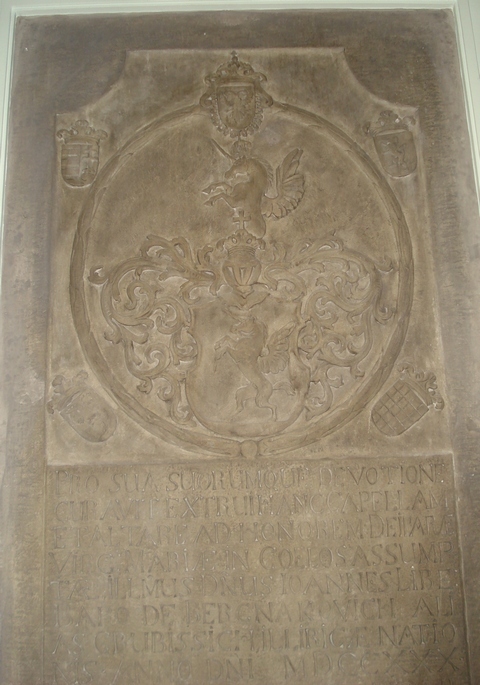 By the courtesy of Josip Sersic and Mijo Juric, Vienna 2009.
kept in the church of the Ascension of Blessed Virgin Mary, built in 1240 in Donja Rijeka (near the town of Križevci). 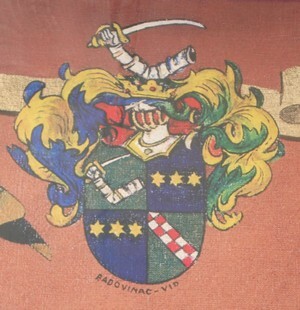 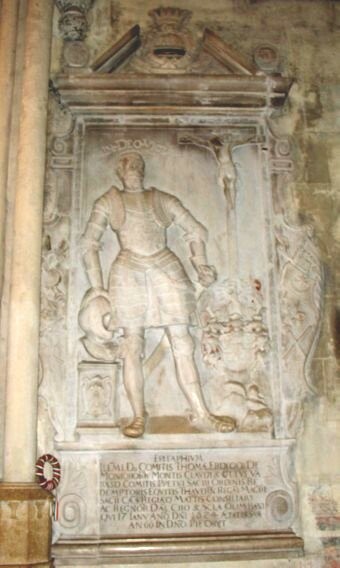 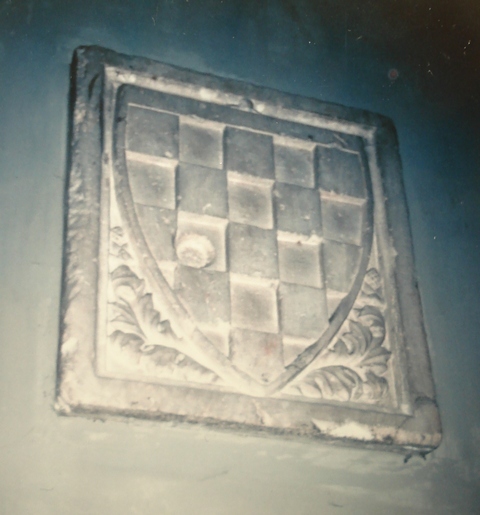 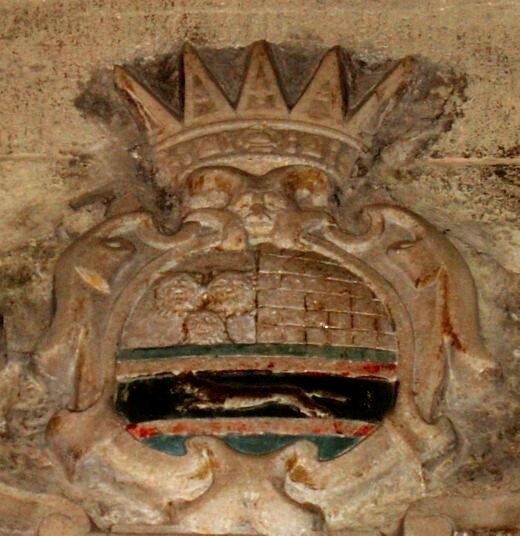 Croatian Coat of Arms in the Cathedral of St. Lovrijenac, Lugano, Switzerland (date unknown), on a right pillar. 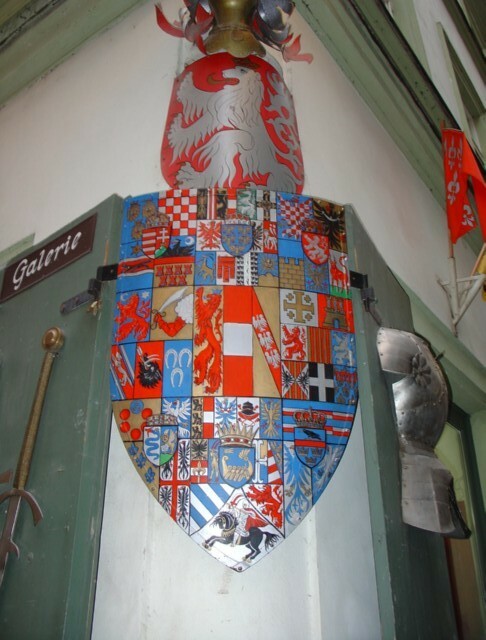 The Croatian Coat of Arms is engraved also on bishop's chain in Lugano (we do not possess its photo). 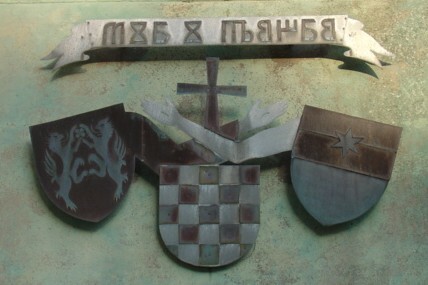 Information and photo by the courtesy of Mr. Seno Markulin, Sidney, Australia. 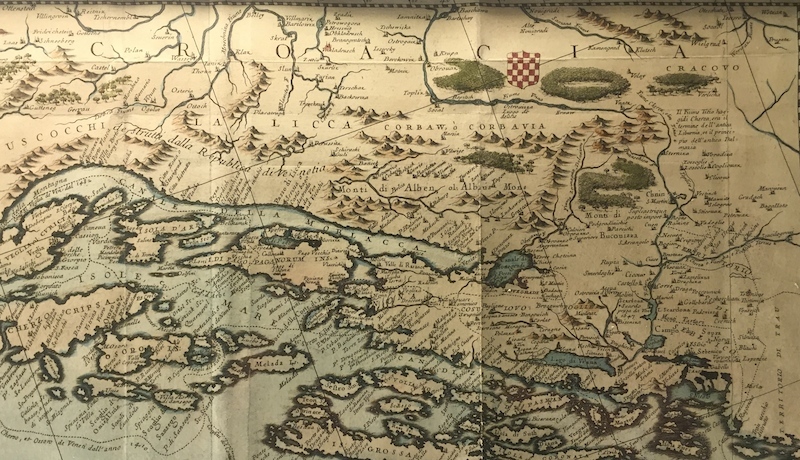 Regnum Croatiae, map of Croatian Kingdom (Johann van der Bruggen, Venice 1737). 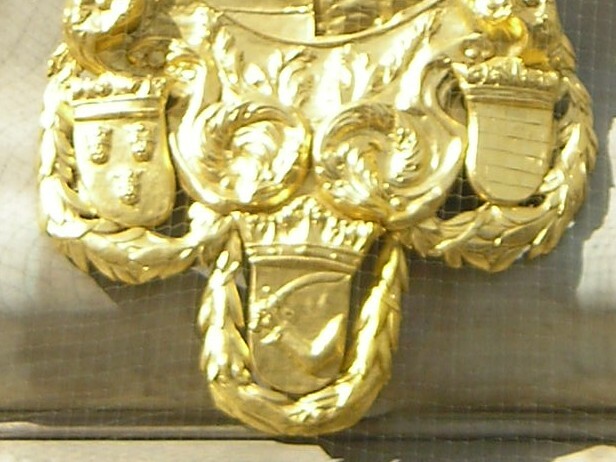 A detail from the Bakar monument. 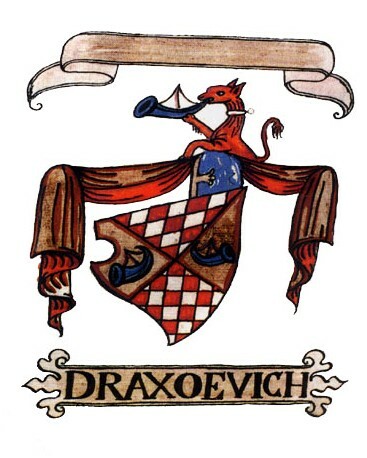 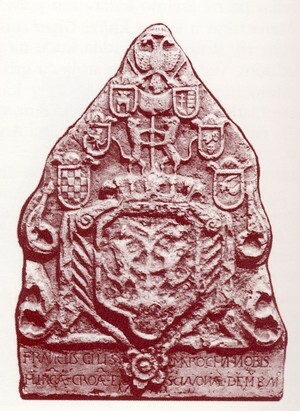 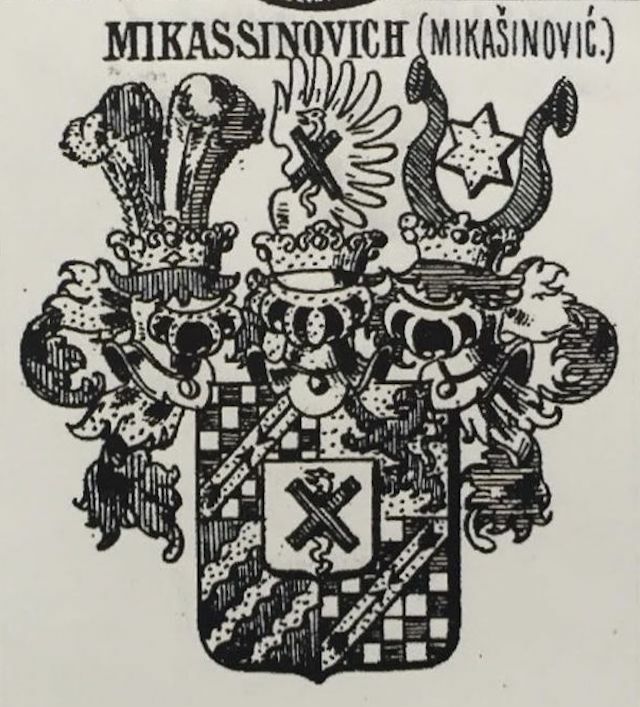 Dubica, Coat of Arms of the noble family of Mikašinović. 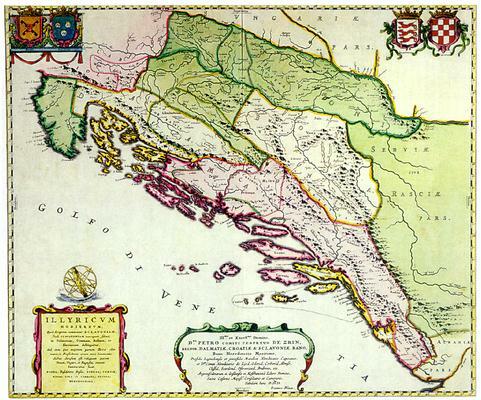 Source Katica Delić: Hrvatska Dubica u slici i riječi, Dubica 2013.